Does “single malt” and “Texas” sound strange to you? It certainly does to me. But with my Texas roots (nearly half of my family lives in the state) I figured it would be worth a shot—even with a price tag just under $70. 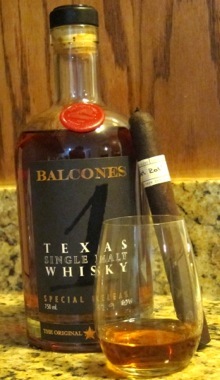 Plus, it’s not like Balcones Distillery hasn’t won any awards. In addition to being named “American Craft Distillery of the Year” by Whisky Magazine, their various spirits have racked up accolades including a handful of prizes for this single malt from the Lone Star State. With all that in mind, I got down to business to try this 106-proof creation from the Waco, Texas-based operation. “1” Texas Single Malt is a medium copper color. The nose is surprisingly traditional (scotch-like), with burnt sugar, dried fruit, and a little oak barrel and vanilla. On the palate, it has a rum-like sweetness (not that unlike the Edradour 10 I recently wrote about), along with roasted pecans, grain, and maltiness. The finish is short and leaves the mouth a bit dry, while anticipating the next sip. Complex, yet surprisingly classic, the “1” Texas Single Malt is best paired with a mild or medium-bodied cigar. I’d particularly recommend a Connecticut-wrapped Davidoff Grand Cru or E.P. Carrillo New Wave Connecticut. I won't drink anything that hasn't been transformed by a deep sense of place. What am I, a neanderthal? I think not! Thanks for the thoughtful review, Patrick. Glad you like the malt.